I’ve been really busy since we wrapped up all the admin for the Festival about a week ago. Fifteen paintings framed, and two Ecclesiastical Faculties done and in the post to the Faculty Office! 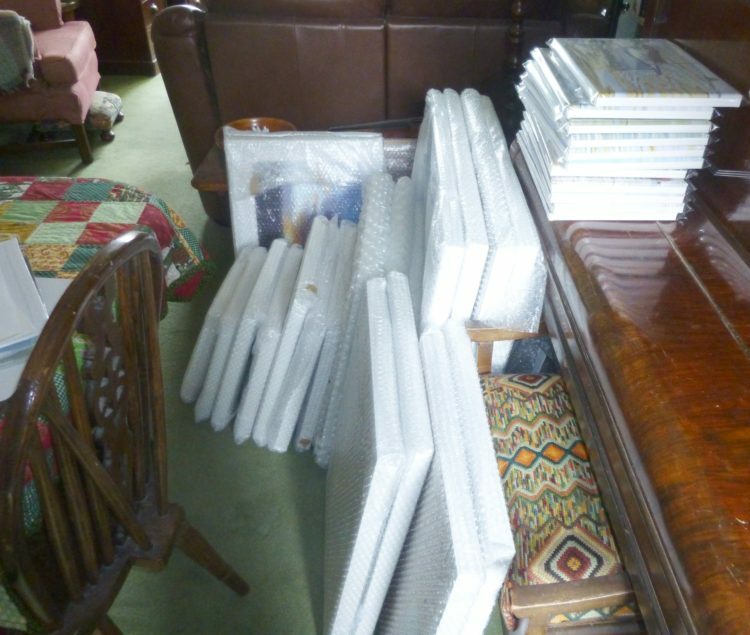 I now have twenty-one paintings that are destined for the Naze Tower Gallery for my solo show, all labelled and in bubble wrap in a big stack in my dining room. What did we do before we had bubble wrap . . .
On the edge of the piano you can see a pile of new canvas prints which will be going to the Naze Tower Gallery, too – wrapped up, but still waiting to be labelled. There will also be new greetings cards for sale in the shop at the bottom of the Tower. Everything has to be taken over on 6th June – Liberty Bell -X (my Land Rover) will be loaded high! Thinking about canvas prints, I realise that I completely forgot to add my new monthly print for the end of April. April 30th was the first Saturday of the Lexden Arts Festival, and I was completely in Festival mode so it never occurred to me! As it is closer to the end of May now I’m just going to skip that one, but will be adding a new print on the last day of May. Unfortunately, I’m having to put up the price of the canvas prints, as my supplier has increased their price by quite a lot! They will remain at £25.00 (including postage to UK mainland) until the start of the Naze Tower exhibition on 11th June, and from then the price will increase to £28.00. So if you’d like one at the old price, now is the time!